Fall is my favorite. Truly it is. So naturally, I like a cozy decorated-for-fall home. This year, I am just coming off of quieting the house and it felt really good. When putting accessories back in to each room, I was really selective and picky – nothing made it back that is not practical, pretty or meaningful. It was a mad dash to get the house photo-ready, but I made it (just barely!). I’m so pleased to be joining an insanely-talented group of bloggers on the Finding Fall Home Tour. You can start at the beginning here and I’ll link below to the next stop. If you are coming from Rhoda’s lovely tour, welcome! Today I’d love to show you the front of our house (the entry, half bath, my office and the dining room). Next week, we’ll continue the tour with the living room and kitchen (I’ll give you a few sneak peeks of those rooms today because I’m terrible at waiting). As you will see from the photos, I’m slightly addicted to neutrals and try to keep things interesting by adding a ton of texture. Pattern, sheen, metal, varying wood tones – all of these elements are the base of how I love to decorate. When you step into our house, we have a nice open entry. A full mirror, graphic rug and sturdy bench work well in our busy household. Right off the entry is the small bathroom our guests use. Lots of mixed metals in there! (and a big pumpkin painting that I still can’t believe I painted). Of all the rooms in the house, my office is my favorite. It feels cozy and fresh and is where I go to work, create and just be emily. I recently pulled out the carpet (!) and have yet to replace the floor. I honestly like it one hundred times better even with just the painted sub-floor. The rest of the carpet in our house better start counting it’s days because soon it is all coming out. (see more of my office and the painted wallpaper here and here). Off the entry and across from the dining room is this bump out where the stairs are that fits our piano perfectly. Last week, I painted it white. It was a pain, but it looks great and it was well worth it (tutorial coming with tips for how to paint yours if you are so inclined). Our dining room doesn’t get a ton of use but it’s one of the first rooms you see when you walk in the house, so it’s important that it sets the tone for the rest of the house. It’s currently decorated with neutrals (of course) and a pretty mix of textures. In the corner, the bar cart is host to our annual thankful tree (see the first year here, and last year’s updated look here). The tags are ready for the kids to write on earlier than we usually start, but I think it will be nice to spend the whole fall season being intentional about giving thanks. Stop back next week for the full details. Thanks for coming by today! Up next on the tour is my cutie friend Ashley from The Handmade Home. If my house feels a little too neutral to you, you’ll love Ashley’s because she is not afraid of color and uses it so beautifully. Can’t wait to see what personal touches she’s added to their home. You can see the whole line-up of fall house tour bloggers here, get fall decorating ideas galore on the BHG + Finding Fall pinterest board, and be sure to sign up for Better Homes & Gardens 100 days of holidays list. p.s. a new WEEKLY GIVEAWAY is open today … click here to check it out and enter to win! I am just going on the house tour now and wanted to tell you how warm your home looks. The attention to detail is incredible. I love that window door separating your dining room – Stunning!! So pretty and love the colors :) Nicely done! Emily, your home is amazing! I have always loved your Thankful Tree! GORGEOUS! as always! Just love your style, Emily! Your home is so beautiful! I love the muted color palette and all the Vintage touches. Thanks so much for the tour! Beautiful home tour! 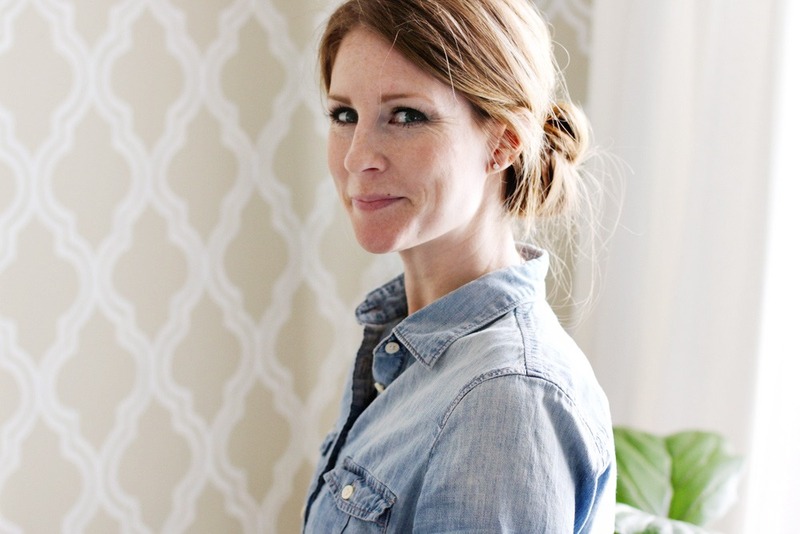 I have read your blog since discovering it over on Holly Mathis Interiors. Just wanted to let you know that I appreciate that you take the time to write and I enjoy your blog! Love your style and that pumpkin painting is AMAZING! What style and size bag did you pick out? I’m seeing the laptop style but wondering if the base is wide enough to use as a purse? I love all your décor! You have a great eye for keeping things simple but interesting and so pretty! Can I ask where you got your entry rug and bench? I’ve been looking for something similar on both accounts. Looking forward to the piano painting tutorial. A wonderful woman at church is giving me one that needs some love. Thank you! I love your fall décor. I usually shy away from fall… I am not a huge fan of oranges/reds but almost always lean towards neutrals. You made neutrals look beautiful, fallish & warm! Great Job & thank YOU for the inspiration! Such a beautiful home! I’ve been thinking about painting our old, battered piano for a while and am also looking forward to your tutorial. I love your taste Emily! I think I could move right into your home and not change a thing. :) And yes, I’ve been wanting to paint our piano too so I’ll be looking forward to seeing your tutorial. Love your fall touches. I really love the light fixture about the dining room table. Do you resource information on it? By the way, I feel I must tell you I’m visiting Seattle this week for a conference! First time to visit your lovely city!! Funny how this blog thing connects folks. is the welcome sign on the mirror a decal? Emily- beautiful as always and very inspiring. My house flows very similar to your layout. I love the runner in the dining room and the light. Where from? Both pieces are exactly what I am looking for. I know you said you were going to do a tutorial of the piano painting, but I am dying to know what type of white paint you used? I have been wanting to paint my desk white but want a paint that will stand up to use. Your home is lovely. I so admire your energy to keep your decor fresh and seasonal, great job. Yes, piano painting post coming! I’ll tell you all the details there. So beautiful!! Would you mind sharing the main neutral color on the walls?? Thank you! I LOVE your style! Thank you for letting us in your home! I love your home post-quieting but I also LOVE your home pre-quieting! Your new entry way is beautiful and simple. But… I was obsessed with the dresser that used to be in your entry way. I even bought a dresser to redo that looked like yours! Ummm… if your looking to get rid of it then I know a sweet woman that would take very good care of it! ;) Seriously though, you are an inspiration to many of us! May you have a blessed day, Thanksgiving, and the whole year through! The dresser is great and works well in the entry, but I’ve been craving more simple pieces and was ready for a change. It stores all of the kids’ art supplies and is currently parked haphazardly in my office – not sure where it will end up! Your home is gorgeous! So much to love. The hanging window that divides the entry from the dining room is genius! And the piano… I’m constantly going back and forth about whether to paint mine or not. It’s hard to commit, but I love how yours turned out & will definitely read your piano post. Inspiring home… thanks for sharing. love the new dining room table chairs and that beautiful pew! Beautiful house tour! I’m a color-lover myself, but you’ve done an amazing job of adding so much detail and texture to keep it so interesting!! I’m particularly in love with the ‘sneak peak’ of the antique stadium/theatre seating – so beautiful. Absolutely gorgeous! I have been feeling very uninspired to decorate for fall, but you have solved that. I just gussied up my dining room table with a riff on the layered runners! Thanks for sharing your beautiful home. Good job. Every thing is so lovely. I love Fall. Thanks for the tour. Love all the texture going on. Could you tell me where the dining room ceiling fixture is from? So pretty…as always. Loving all of your warm & cozy touches throughout your house. I love your front entry bench…did you have that made? I’m off to hang put out some of the fall prints that I purchased from you last year. Thanks for sharing your lovely home!! I have been struggling with my office walls – your office has given me some inspiration – thank you! Your home is gorgeous – warm and inviting. I have pinned most every plate here! Such wonderful ideas and idea generators! AHHHH!! !I LOVE Emily! Such good work! Ok, so over the years I know you are always so good about telling us where you find all these treasures. You are such a trend setter:-) I know you said the front rug was UOutfitters, but maybe where the bench and mirror are from? Super great set up, but I loved the dresser when it was up in front too. You are so good at moving things around! Absolutely gorgeous! I want to move in, ha! You are such an inspiration. Thank you for sharing your lovely home with us. Loving that gratitude pin board idea. So pretty and simple. Perfect! Beautiful Emily, I never tire of black and white!!! Yes, where did that striped bag come from? The striped bag is from Better Life Bags. I’m having a tough time adjusting to the Fall. Your home feels so comfy & cozy, it’s inspirational! Where is your dining room light fixture from? LOVE it! Thanks! In France, the fall is not here yet, if we take the date is Tuesday, September 23! But September is really very beautiful and hot! As the summer has not been super nice, we took the opportunity! So this morning I did my Summer House Tour on my blog! I know I will soon change the decor, so I make my pictures that I had not taken the time to do before! If you want to come and see …! Good evening and a good week to you Emily and your family! Love, love, love this Emily!! I see you added a gorgeous church pew to your dining room and I love that you added a full length mirror and bench to the entry!! So cozy and fun!! Happy Fall!! I just adore your home Emily! It is so welcoming and cozy! Love all the texture and neutrals for fall…simply beautiful. Your home is beautiful! What is the source for the x bench in your entry? It looks perfect in that space! Thank you so much for allowing me in your home! Absolutely beautiful! You have a beautiful home…I love all the neutrals and textures! I was just going through your fall home tour and have a completely off-topic question :) I noticed your seagrass dining chairs…we just bought seagrass barstools (technically hyacinth, but they look/feel the same as the seagrass ones, except with perhaps slightly less protective finish (polyurethane?) on them). Ours are light in color like your chairs and we have two young boys; any tips on how you protect and/or clean your chairs? I’ve searched Pinterest and the web in general and haven’t come up with anything! Thanks! Those dining chairs are not great for kids! I’m not sure if there is anything you can do short of covering the seats with a cushion to keep crumbs and spills out of the weave. We don’t regularly eat in the dining room so it hasn’t been an issue (and truth be told, these chairs have been used all over the house and I just recently moved all four in here). Anyone else have any cleaning tips? Lovely tour. Would you mind sharing the source for the cross rug in the entry? Emily – – Love this!! Where is the adorable metal tower in the hall bath from??? SUPER inexpensive and actually quite nice! Love your home! It’s truly beautiful! Thank you so much for sharing and inspiring! Thanks Karianne! I’m off to check out all of the tours from yesterday! It is a great company with purpose and you can feel good supporting! I was just going to comment that I have that exact same bag! Don’t you love it & the company? I was also inspired to dress my (rarely used-although we are trying to have Sunday breakfasts there) dining room table–your simple table runner + apothecary jars made it look less intimidating & time consuming. Every detail is so beautiful, elegant and welcoming! Thank you so much for joining our tour! Where did you get the office desk?? Love! We made the desk using an old door and table legs from ikea. I painted the door and added a grosgrain ribbon using upholstery tacks.